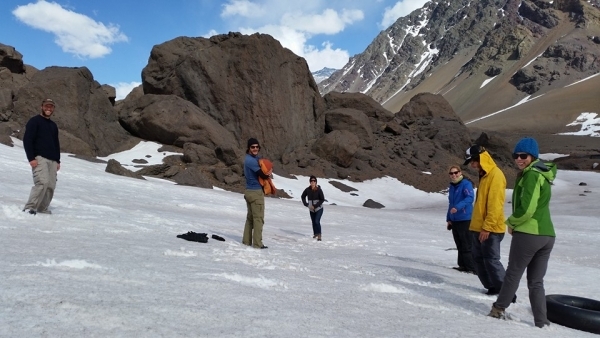 You may recall that tour medic Irin’s post from Northern Argentina. Here is tour staff Will explaining some more of that dramatic time of the tour. The South American Epic is now in the Lake District of Chile south of Santiago. More reports from Chile to follow. Our time in Northern Argentina was spent meandering by bike through lush vineyards by day, and by night enjoying wine and tasty snacks in pleasant spring-time temperatures (read more about wining and dining in my last blog post). For our first two weeks in Argentina the snow-capped Andes sat placidly on the horizon, but as we moved out of the Mendoza region and towards the border with Chile, those same mountain views became more and more dramatic. 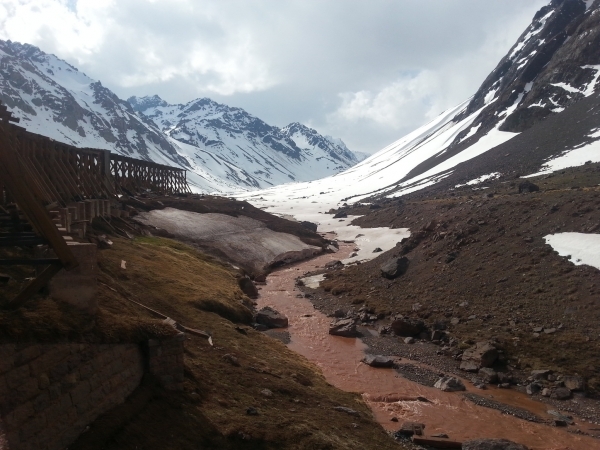 The weather also became more unpredictable as we started our ascent back into the mountains. Temperatures dropped and the threat of precipitation loomed. It loomed, and then it attacked. 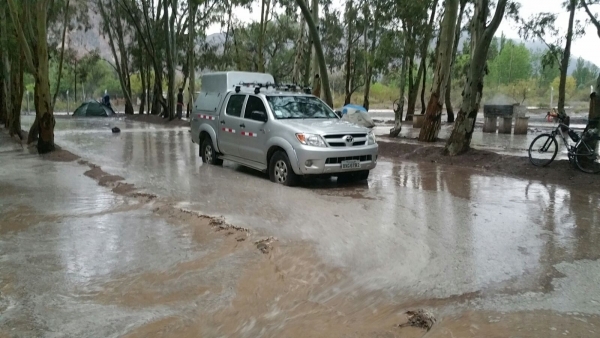 After dinner one night in a small campsite near Perdenal, a deluge of rain and hail pounded our campsite. Water ran though the campsite, like a river, as staff and riders alike raced to get their tents to higher ground. The next night, forecasts of an electrical storm forced us to pack up our tents and head into Ushpallata one day early (here is the report from that epic day). We arrived into Ushpallata under the cover of night, but when we woke up we discovered that we were completely surrounded by white capped mountains. 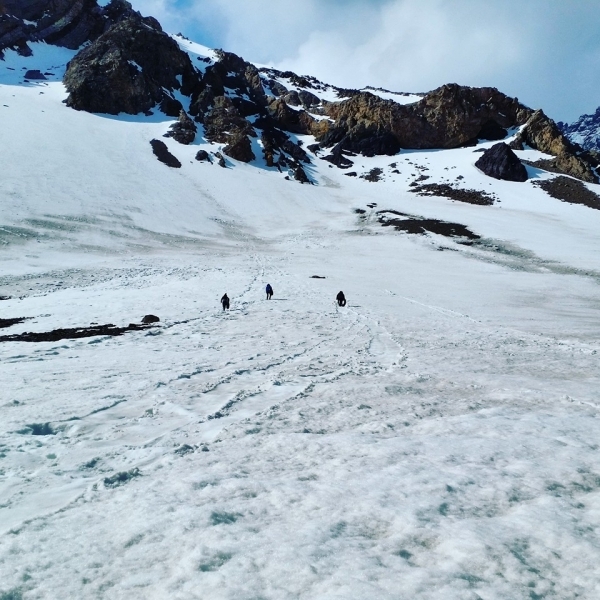 From Ushpallata, we spent an incredible two days climbing up narrow mountain roads, zooming through covered tunnels, passing by ski-hills decorated with rustic ski-lodges, all the while taking in ever more stunning views. The second days’ climb to the summit had us riding in the shadow of South America’s highest mountain peak, Aconagua, which sits at an impressive 6962 metres. At the approximate base of this massive rock sits the small ski town of Las Cuevas. This quaint little village is built right onto the edge of the slopes. Being springtime, the village was emptied out of tourists, and the SAE crew had the whole place to themselves. Riders filed in and made their way to their dorm rooms like school kids on a ski-vacation – and later made their way to the cozy wood-clad lodge for drinks and homemade empanadas. Dinner was being prepared by our host, Carlos and his wife, who owned the lodge. For most of the afternoon they were busy preparing our dinner, a lovely meal of homemade pasta and savoury tomato and beef sauce. Because they were preparing dinner, the staff team had some free time to have some fun and explore the area. Antonio, our Brazilian bike mechanic, had his first encounter with snow, to which he was very pleased. 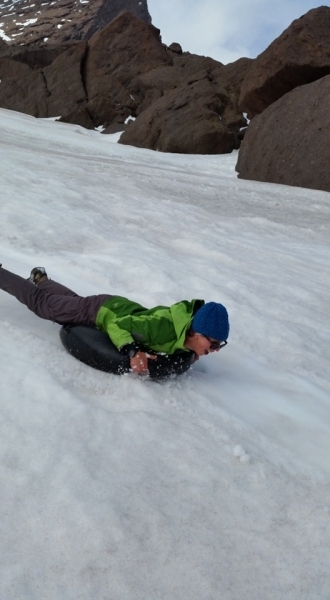 Our medic Jodi, who is no stranger to snow-cap mountains, insisted that a sliding party was in order. It didn’t take much convincing the other staff. Without hesitation the extra tubes from the support vehicles were inflated, extra layers applied, and the TDA team was off to the slopes. It was the first time sledding for our Tour Director Sharita, but I can safely say it was all of our first time with high altitude tubing. 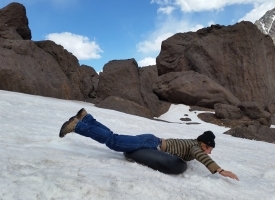 In my opinion, the best way to experience the beauty of the Andes is to hurl yourself down them in a giant, improvised, inflated, rubber donut. 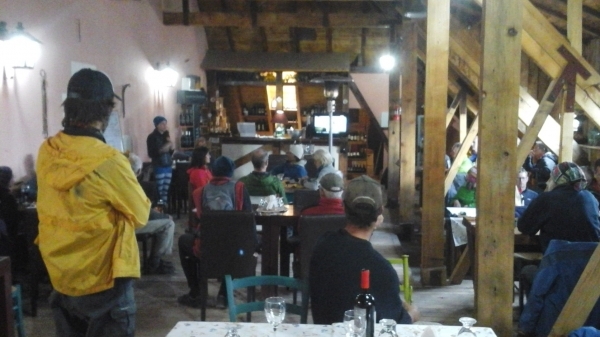 Our little foray in the mountains was just what we needed to recharge, and muster up the energy to make the border crossing into Chile the next day. 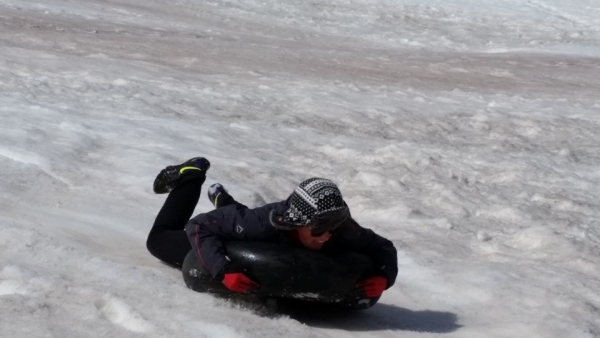 A few more shots from our tubing…. 0 comments for "Tubular Times with TDA"
Leave a comment for "Tubular Times with TDA" by visiting the original post on our TDA Global Cycling blog.